Well, probably not, but I am wearing these today, and how cute are they????? 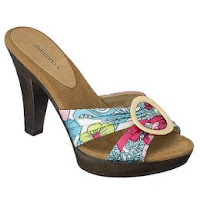 From Target, these Xhilaration Terra Sandals are just $17.99. They are actually quite comfortable and such a bargain. Be careful, though, since the print is a multi-color floral, the first pair I picked up totally didn't go together- the left one was aqua/green and the right one was pink/grey..... I had to hunt around to find a pair that looked like it was a proper pair of shoes. Well... I was running, but with all the packing/moving insanity I've kind of fallen behind. Keep me on the list though - I'm definitely getting back to it once everything is sorted out with our new house. LOVING the shoes! I'm so going to Target! I love those shoes! Too cute! I'll have to look for my own pair. Those are SOOO cute! I wish I could walk in heels!! I love those shoes. They are bootifull!!! I can't wear high heels though. I wish the shoe industry would make adorable shoes like that without heels. I'm a slacker. I don't wear any kind of heel. AND shipping at Target.com is free right now with a $50 order. So you should pick up a few pairs, b/c they're really cute! !